Pop these protein-packed pearls in the oven ahead of time and you will have a great snack for guests as they arrive and mingle. 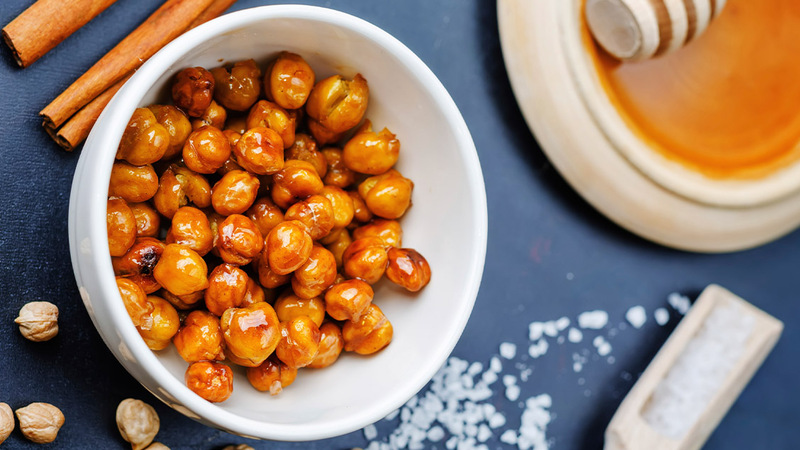 Ikarians include chickpeas in many stews and soups, but also eat them as a snack, dried and salted like peanuts (or in this case sweetened with a touch of maple syrup!). They are higher in fat than other beans, but nearly all of their fat is unsaturated, and you avoid the sugar rush that higher carbohydrate snacks might cause. Green bean dishes are customary for Thanksgiving and other holiday gatherings, but why not add some variety and festive fall colors to the bean offerings this year? Ancient foods and their culturally traditional combinations, such as the “three sisters” of Mesoamerican agriculture (corn, beans, and squash) may reduce the risk of disease, especially diabetes. 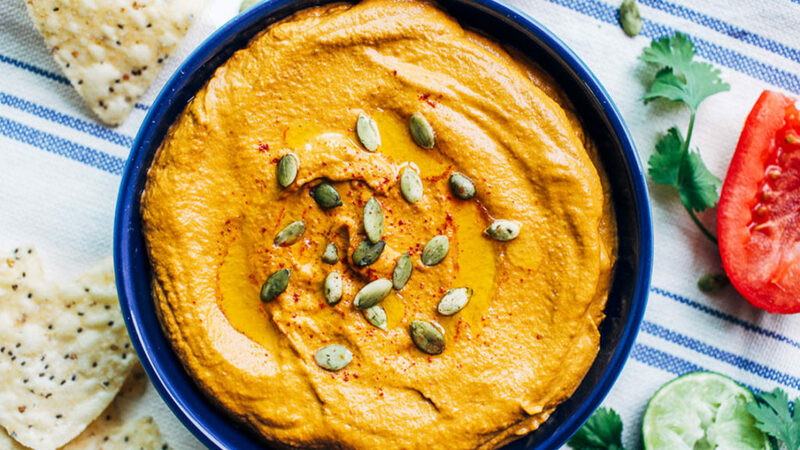 Pumpkin is perhaps one of the most beneficial foods to include in your diet. More than 150 varieties of wild greens grow all over the island of Ikaria. Rich, dark, wild greens are a great source of minerals like iron, magnesium, potassium, and calcium, as well as carotenoids – the colorful pigments the body converts to vitamin A. Eating a cup of greens daily seemed to be one of the keys to longer life in Ikaria. If you don’t have wild greens readily available, cultivated greens such as kale, collard, and beet greens have nearly the same plentitude of nutrients. With only a handful of ingredients, one of them being squash (a Nicoyan favorite), this is an easy recipe to throw together before the guests arrive, or if you’re running out the door Thanksgiving morning and need a quick dish to pass. Serve this festive dip with fresh cut vegetables or some crusty sourdough bread while you’re finishing the final touches on the main event. Pumpkin seeds (pepitas) are high in vitamins A, B, K, thiamin, riboflavin, calcium, iron, healthy fats, and protein. They also include magnesium and zinc, which promote healthy immune function. Including legumes in the diet might be the most important longevity predictor worldwide. Every culture has its own legume recipes and traditions and you just might make a new tradition of sharing this white bean casserole with your family each Thanksgiving. 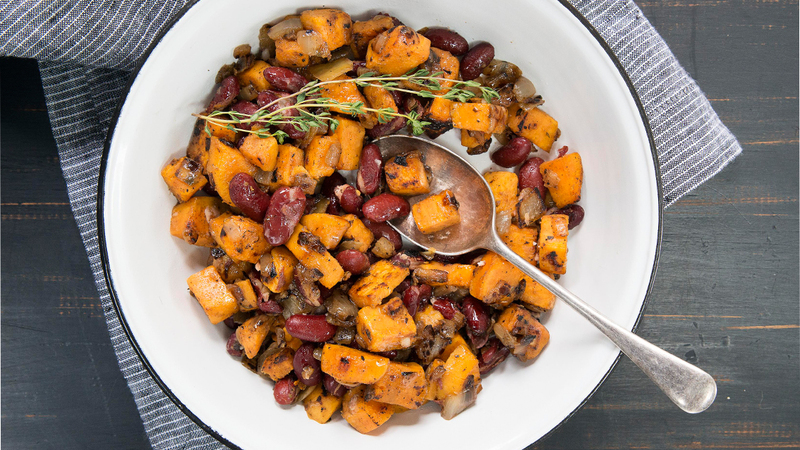 It’s sweet and savory and includes a handful of blue zones superfoods like beans, squash, and olive oil. Replace the usual preservative-packed green bean casserole with a lighter and livelier offering this Thanksgiving. 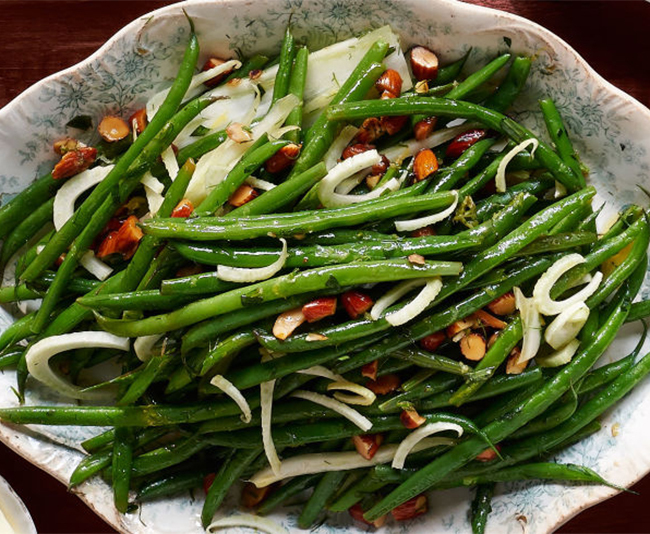 Fennel’s warm, anise-like flavor enhances many traditional Sardinian dishes and pairs well with the light, earthy flavor of the green beans in this dish. 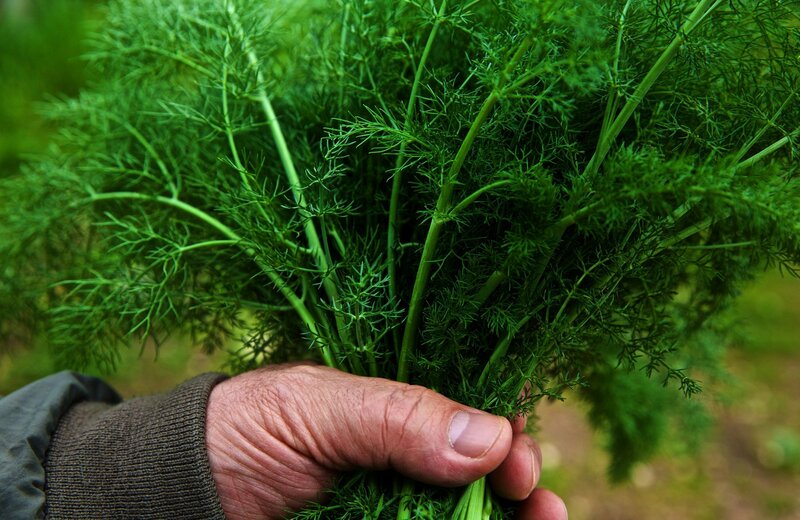 Fennel is rich in fiber and soluble vitamins such as A, B, and C, and is also a good diuretic, helping to maintain low blood pressure. 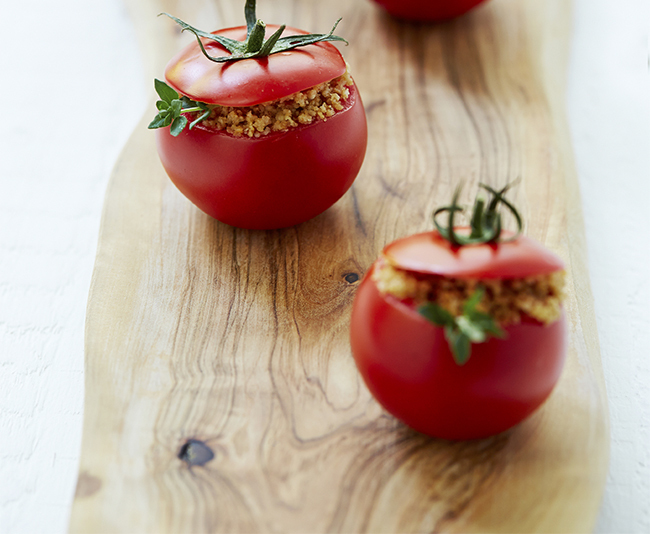 These stuffed tomatoes have the WOW! factor you desire for a colorful Thanksgiving table. Barley is one of the staple foods in Sardinia, where it is ground into flour for bread and generously added to soups and stews. It’s also known for its ability to lower total and LDL cholesterol. 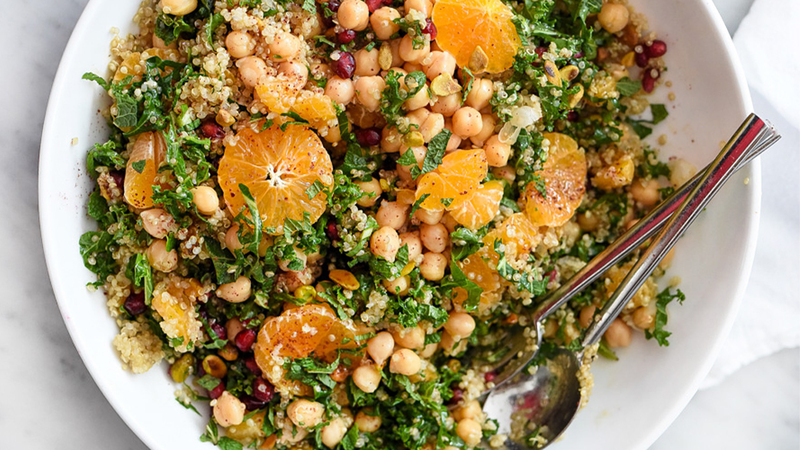 This grain salad could replace the heavy stuffing that is often made with unhealthy white bread. 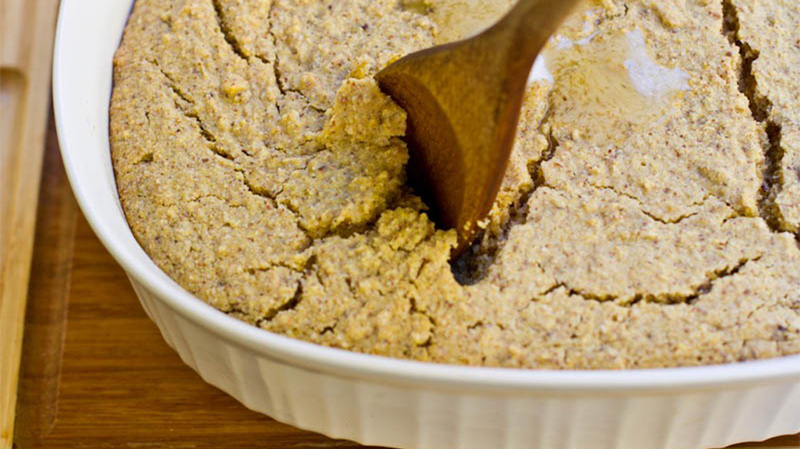 Millet is a naturally gluten-free grain and is high in magnesium. 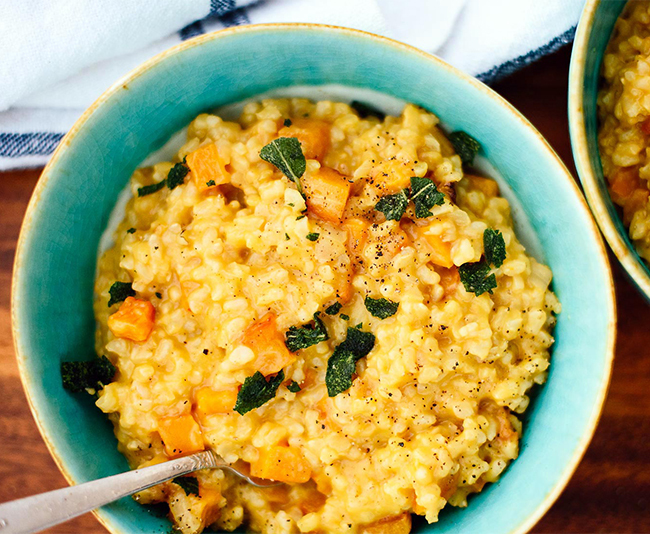 All varieties of millet contain high levels of antioxidants, making them a power grain to add to your table. 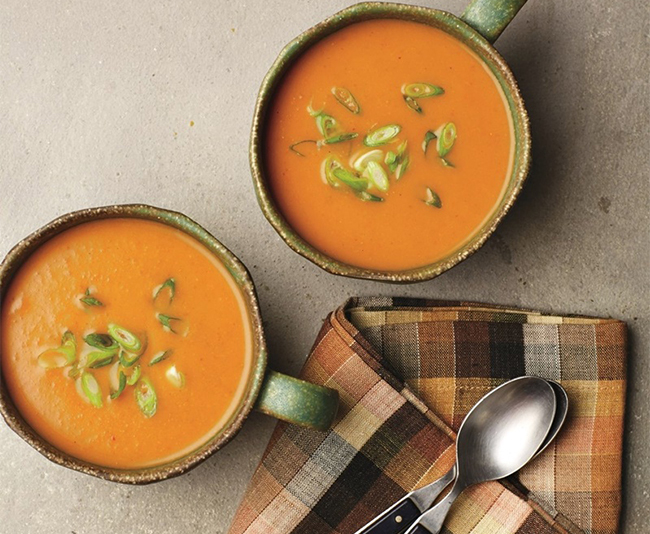 Pumpkin isn’t just for pie with this creamy, vegan curry soup. 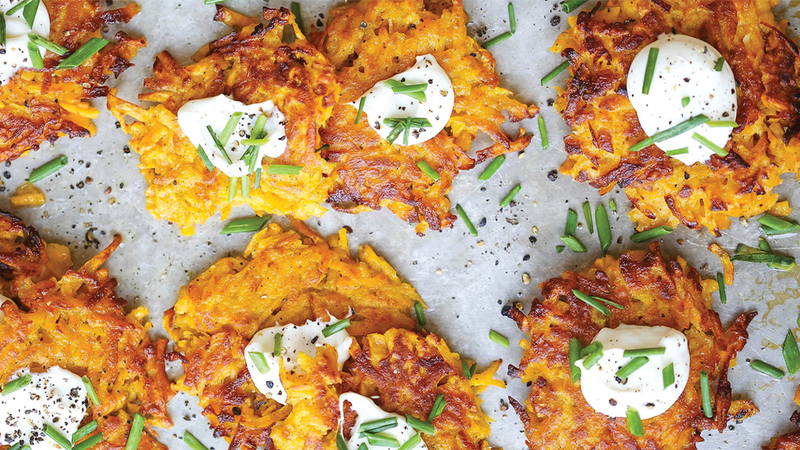 Pumpkins boast the antioxidant beta-carotene, which may play a role in cancer prevention. Osso Buco is traditionally a meat-based dish, but replacing the veal with porcini mushrooms gives this dish a complex and hearty flavor without the meat. This is also an easy dish to throw together the day before Thanksgiving as it reheats quite well. Mushrooms are high in antioxidants, contain B vitamins, copper, and selenium, and are associated with lowering inflammation and increasing immunity. 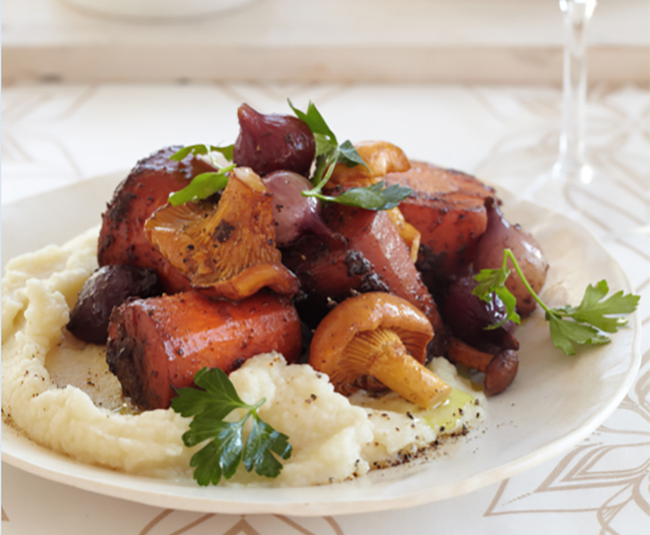 Mushrooms are a great cancer-fighting food. 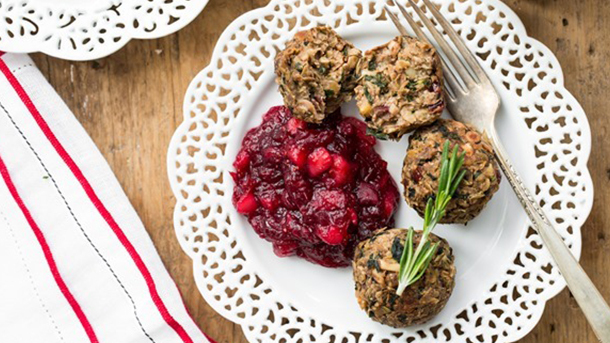 These lentil mushroom walnut balls are festive, full of plant-based protein, and a great way to sneak more legumes into your holiday feast. They’re easy to make ahead of time and have ready for the big day when you’re busy entertaining guests. 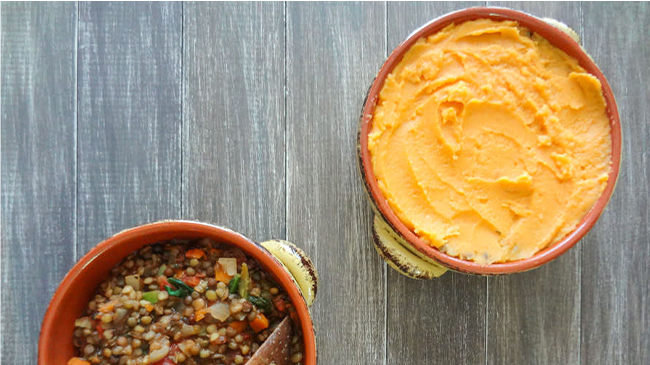 Nearly fat-free and filled with fiber, lentils are a power legume. Lentils hold their shape better than other beans, which makes them easy to work with for recipes like this. 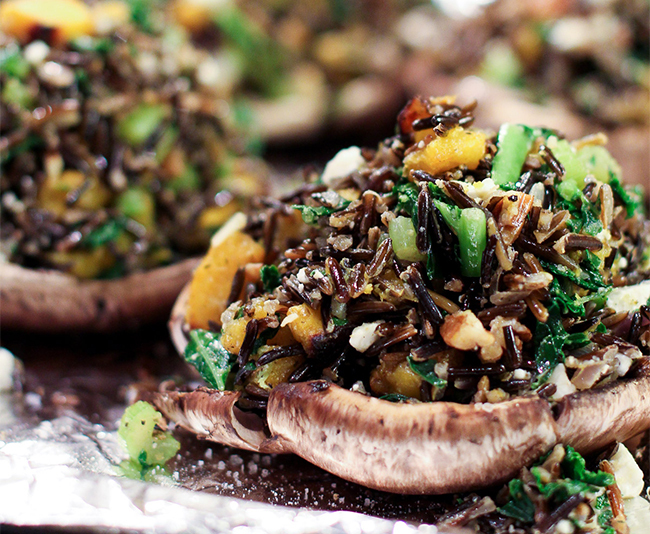 Wild rice, squash, and kale – this recipe marries all of our favorite fall flavors into one delicious stuffed mushroom. Wild rice is the only grain native to North America and is considered a whole grain by the US Whole Grains Council. Whole grain consumption has been associated with lower risk of cardiovascular disease and cancer. Wild rice’s earthy flavor, high protein and fiber content and truly North American/Native American origin make it a perfect grain for the occasion. Risotto is a creamy fall comfort food, and this one, made with brown rice instead of white, is a bit healthier than your average risotto. 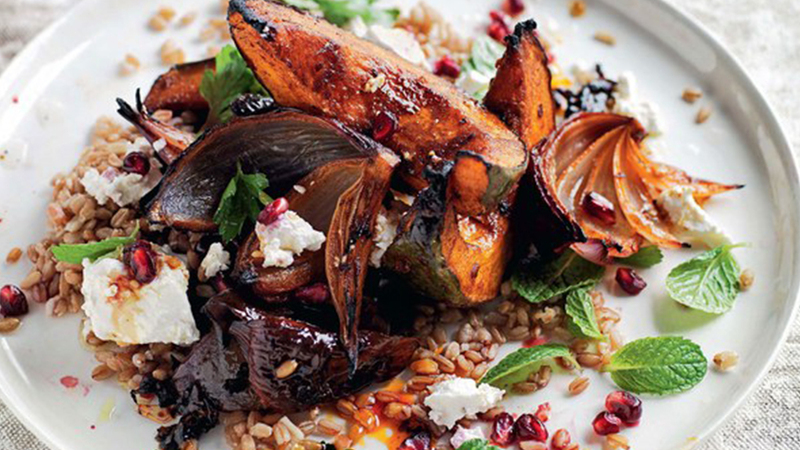 It’s also a set-it-and-forget-it dish because the rice and squash cook in the oven at the same time! In Okinawa, where centenarians eat rice every day, both brown and white rice are enjoyed, but remember that nutritionally, brown rice is always superior. The milling done to produce white rice strips away dietary fiber and nutrients, including most of the B vitamins and all of the essential fatty acids found in rice. 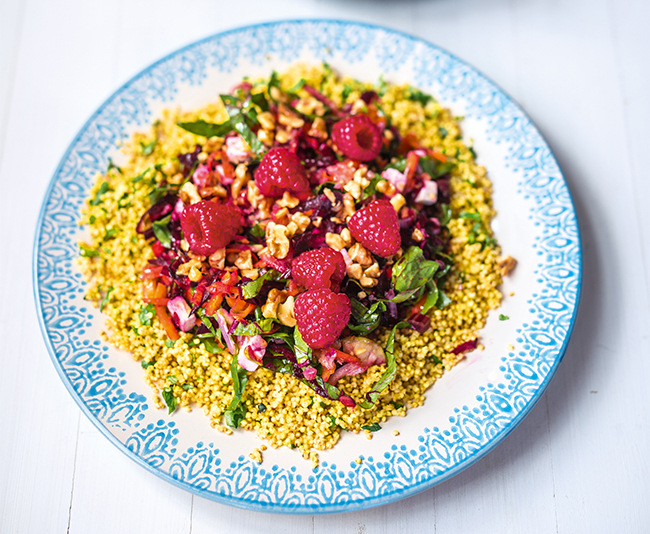 Not only is this dish chock-full of nutritious vegetables, it’s almost too pretty to eat. 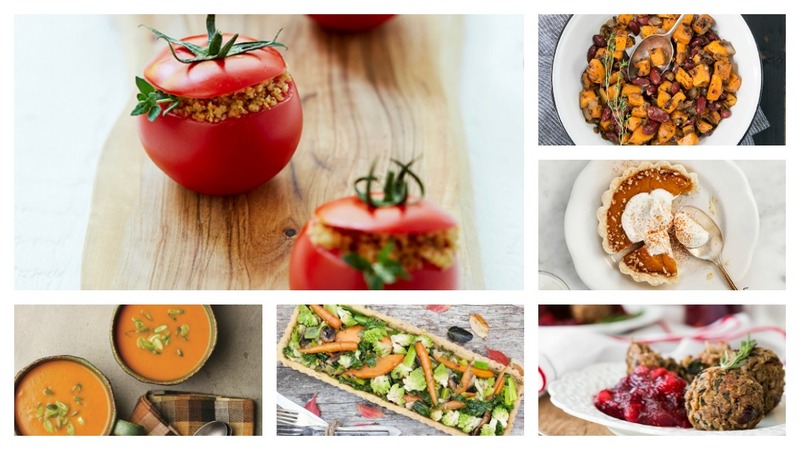 Add some color to the usually beige Thanksgiving menu. The crust is made with both almond and chickpea flour. Chickpea flour is a complex carbohydrate the body can digest slowly, therefore energy is sustained and you avoid the crash that follows consumption of refined carbohydrates. 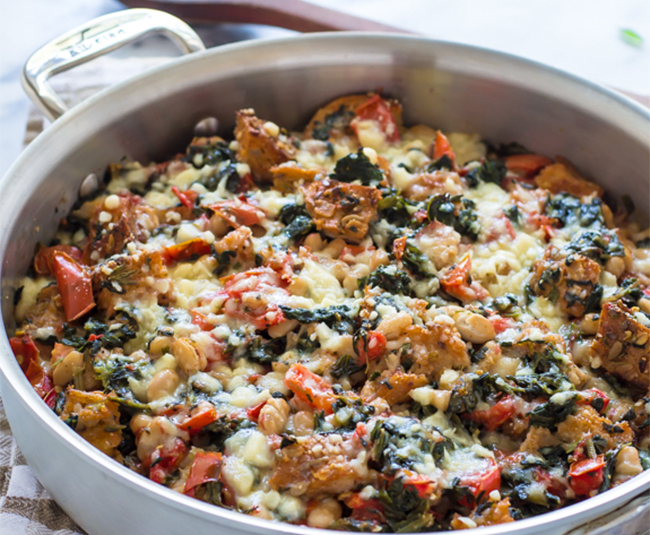 Use your crusty, leftover Ikarian-Style Sourdough bread for this one-pan casserole dish that travels well and can be your go-to for those lengthy drives to the family gatherings. Traditional sourdough breads actually lower the glycemic load of meals. 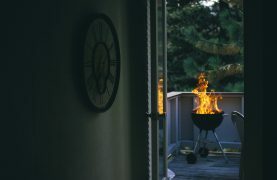 They make your entire meal healthier, slower burning, easier on your pancreas, and more likely to make calories available as energy than stored as fat. Shepherds pies are usually a great way to use up all those Thanksgiving leftovers, but don’t limit it to the scraps – this lentil shepherds pie is easy to pop in the oven and incorporates both protein-packed lentils and complex carbohydrates from the sweet potatoes. 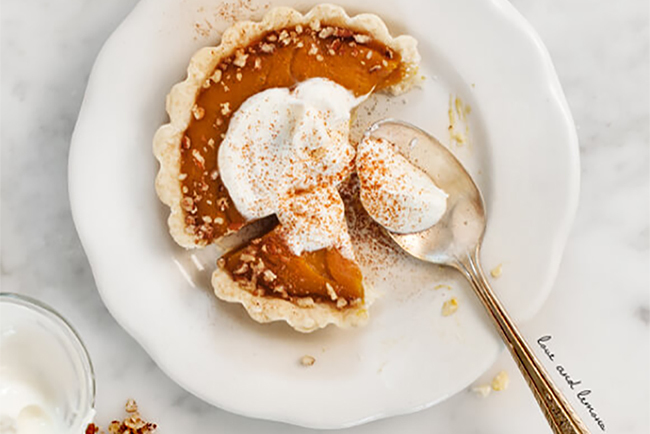 Pumpkin pie will always be a Thanksgiving staple. These minis keep the portion size controlled and are completely vegan. No guilt because you won’t go overboard! 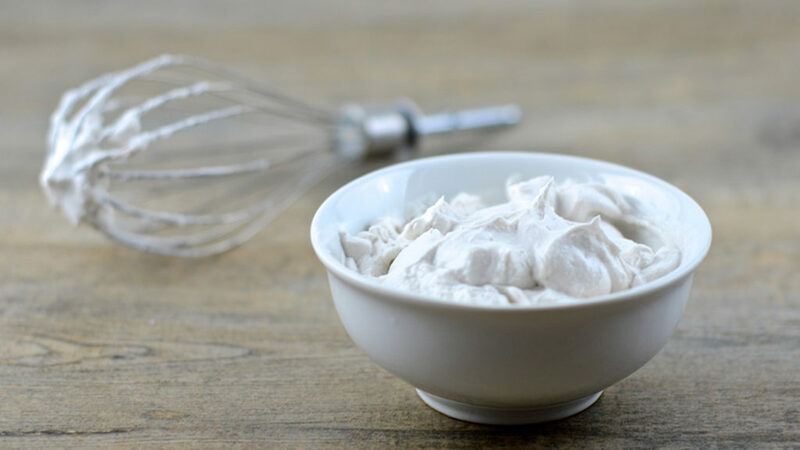 Processed whipped cream from the can is a fun topping, but this non-dairy coconut whipped topping is a healthier choice that also gives you a boost of healthy fats from coconut milk. 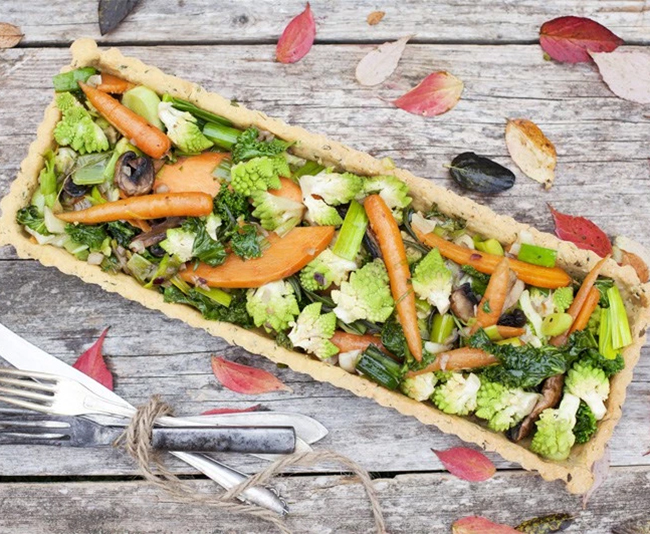 Thanksgiving is truly a Blue Zones holiday. 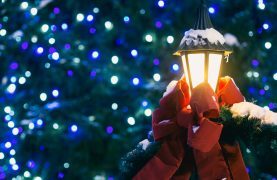 It’s all about putting family first, socializing with friends, downshifting and taking a long nap after the big meal— Power 9 pillars we try to live by every day! 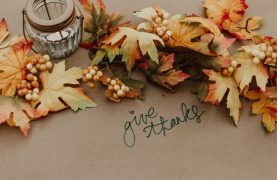 At the end of the day, be thankful for an abundant harvest, a day of grace, a glass of red wine, and an overflowing house full of family and friends.